The Samsung Galaxy Pocket comes in the most modest of boxes. It only offers a single-piece charger and some leaflets. There's no headset in the bundle, and a data cable is missing too - and these are considered essential for the everyday usage. A complimentary microSD card is an outright luxury at this price point. Living up to its name, the Samsung Galaxy Pocket is a very compact set, though not nearly as tiny as the Sony Ericsson minis. Its very own siblings are a better point of reference. 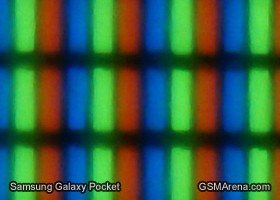 At 103.7 x 57.5 x 12 mm the Pocket is a tad smaller than the Galaxy Mini and almost the same size as the Galaxy Y. The weight of 97 g is about right for a handset that's entirely made of plastic but not remarkably slim. The Galaxy Pocket is based on the same chassis as the Galaxy Y, evidenced by the placement of the connectivity ports, the camera and the loudspeaker. The styling of the Galaxy Pocket is very simple, free of embellishments and somewhat lacking in imagination. 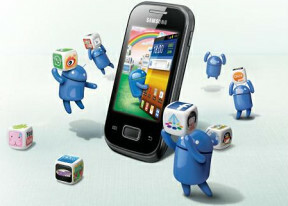 It's built around a 2.8" display, while the Galaxy Y managed to fit a 3" touchscreen in virtually the same body. The excessive screen bezel doesn't look too great though. Overall, the feel of the Galaxy Y borders on sophisticated in comparison and it's not the best looking of phones to begin with. We are not going to hold the cheap look against the Galaxy Pocket anyway, mostly because it is cheap. 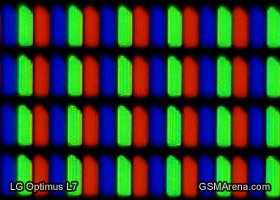 The 2.8" TFT display of QVGA (240 x 320) resolution is at the bottom of the barrel in terms of specs, and we're afraid the actual image quality reflects that quite accurately. Images are highly pixelated, while the low contrast and inadequate brightness make it uncomfortable to use on a bright sunny day. Here's the full rundown below. And here's how its sunlight legibility stands in comparison. As you can see this is the lowest score we have measured to date, so be warned that you might have a hard time finding a proper angle for working with the Pocket when outside on bright sunny days. Below the screen is the usual arrangement of a physical Home button and two capacitive Menu and Back keys. They light up only when touched and otherwise stay out of the way. Above the display there's an earpiece and a proximity sensor to disable the touchscreen during calls. What the phone lacks is a front-facing camera and an ambient light sensor for auto brightness options. Near the top, on the right side of the Galaxy Pocket, which is the usual place in Samsung phones, is the power/lock button. The left side features a lanyard eyelet and a single-piece volume rocker with reasonably good press. At the bottom of the Galaxy Pocket you'll only find a little slit for removing the battery cover and the microphone pinhole. There's a 3.5 mm headphone jack at the top along with a microUSB port, hidden under a plastic cover. The battery cover is plastic (as is the case with most Samsung phones these days) but looks durable and feels nice to the touch. The beveled sides are smooth but the surface within has a fine texture. The 2 MP camera lens is placed on the left near the top and there's a loudspeaker grille in the center. A Samsung logo is stamped underneath. Removing the back cover is easy enough and the 1200 mAh Li-Ion battery you'll see underneath is quoted at 500h of stand-by and up to 5 h and 40 minutes of calls in 3G. The Galaxy Pocket usually lasted a day and a half on a charge. We put the Galaxy Pocket through our traditional battery test on the Galaxy Pocket. 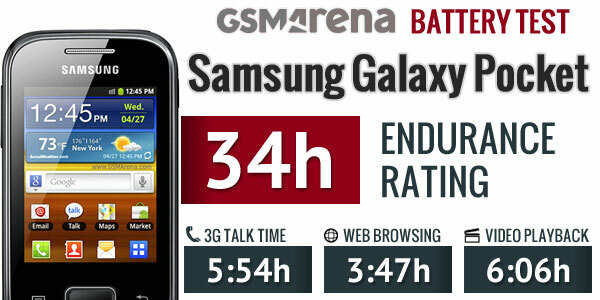 It achieved an endurance rating of 34h, which is quite respectable, given its battery size. You can find the full test over here, while detailed information on how we test is located on this page. The hot-swappable microSD card slot is on the side and the SIM compartment is under the battery. It's hard to expect more from the Galaxy Pocket. It looks cheap but feels fairly durable. Securing a competitive price entailed compromises and the low-quality screen is the most obvious of them. The feel of the device is quite plasticky but the textured back cover allows decent grip. The phone is pleasantly compact and meant for those who value ease of use above style and performance.